Deciding between one square or many could become a thing of the past as paper dispenser manufacturers introduce touchless toilet paper dispensers — sleek devices that dispense premeasured tissue with ease. Similar to touch-free towel dispensers already on the market, touchless toilet paper dispensers are available with automatic or manual operations. 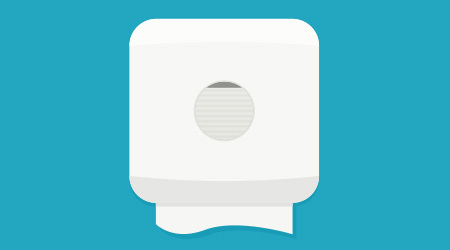 With touchless toilet paper dispensers, users simply wave their hands in front of the sensor and the machine dispenses a single sheet of tissue. Manual touchless dispensers also feature one-at-a-time dispensing — only one end of the tissue is exposed and end users pull out a single sheet of tissue. In addition to contributing to the “coolness” factor in the restroom, touchless toilet paper dispensers enhance hygiene while positively affecting the bottom line for building service contractors and facility executives who pay for their own consumables. Controlling the amount of tissue dispensed is one of the overarching benefits of automatic toilet tissue dispensers. Instead of the strong-handed user taking too much tissue, the touchless models dictate the amount that is offered each time. “We have the free-wheelers, they yank on that roll and it just spins out and they are typically consuming a lot more product as a result,” says Lisa Morden, senior director, global sustainability for Kimberly-Clark Professional, Roswell, Ga.
Manufacturers say there is a 20 to 40 percent reduction in the amount of tissue that gets consumed as a result of using automatic toilet tissue dispensers. The reduced consumption is a selling point for those concerned with the upfront costs for touchless dispensers when compared to less expensive traditional units. In addition, the janitorial labor needed to keep restrooms clean is reduced with automatic toilet tissue dispensers because less paper finds its way onto the floor or stuffed into a toilet. When restroom users take less tissue, supplies last longer. Janitors shouldn’t have to restock dispensers as often with automatic toilet tissue dispensers units cutting down on labor costs. Dispensers that control tissue quantities should deter vandals from purposely clogging a toilet because it will take longer to acquire enough tissue needed to plug commodes. In many cases, touch-free dispensers feature locks, which also helps to reduce tissue theft. Another indirect cost savings is found in the reduction of water usage. Less tissue being put into the toilet means less double flushing; less water is needed to get it down the drain. The amount of plumbing repairs and maintenance can also be reduced with automatic toilet tissue dispensers.